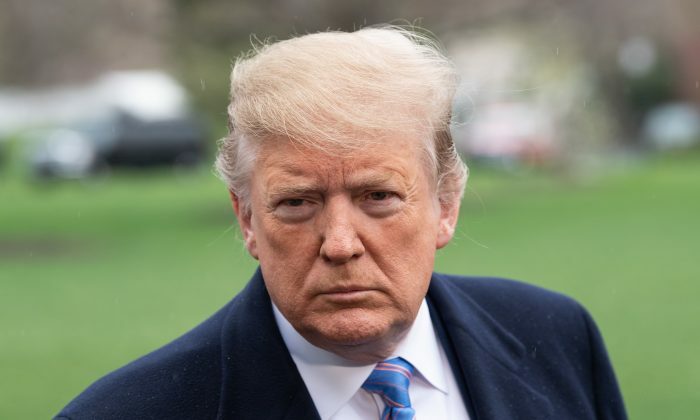 President Donald Trump on April 9 threatened to add new U.S. tariffs on products from the European Union, the latest escalation in the ongoing trade war. “The World Trade Organization finds that the European Union subsidies to Airbus has adversely impacted the United States, which will now put Tariffs on $11 Billion of EU products!” Trump said on Twitter. The United States and Europe have been locked in a years-long spat over mutual claims of illegal aid given to plane giants—Netherlands-based Airbus and U.S.-based Boeing—to help them gain an advantage in the world jet business. The case, which has been grinding its way through the World Trade Organization (WTO) for almost 15 years, is approaching the final stages of arbitration. Trump’s comments came as his administration prepares to work out trade deals with China and neighbors Mexico and Canada. In response, the European Commission said on April 9 it had started to draw up plans to retaliate over Boeing subsidies. Both sides have won partial victories in claiming Airbus and Boeing received unlawful subsidies, but disagree on the amount involved and whether each has complied with earlier WTO rulings. The EU is already facing U.S. tariffs on its steel and aluminum exports and Trump has repeatedly threatened to hit EU cars with punitive duties. A mix of Trump’s deregulation policies, tax reform, and a booming economy are luring European companies to invest more in the United States, signaling that Trump’s policies have been making a difference. At a White House meeting in January, German automakers, including Volkswagen, BMW, and Daimler, said they planned to invest more in the United States, dependent on whether the Trump administration imposes tariffs on them or not. Overall, the automakers were optimistic about the idea of investing more in the United States. Trump lauded German automaker Volkswagen in January for choosing Chattanooga, Tennessee, as the company’s North American base for manufacturing electric vehicles. Volkswagen’s U.S. expansion includes an investment of $800 million in the facility, which is poised to create 1,000 jobs at the plant and additional jobs at suppliers. “Congratulations to Chattanooga and Tennessee on a job well done. A big win!” Trump wrote on Twitter. The Chattanooga plant is the first dedicated location in North America for the production of vehicles using Volkswagen’s modular electric toolkit chassis or MEB. Electric Vehicle production at the site will begin in 2022, according to the automaker.